Wasps are a serious liability in and around the home. Unlike a bee’s barbed stinger, wasps have a smooth stinger which allows them to sting multiple times when they feel threatened. This can be very problematic for those who are at risk, such as elderly, children and anyone allergic to bee stings. In the larval stage, wasps are parasitic and feed on other insects. As adults, they feed only on nectar. Some wasps are omnivorous, feeding on a variety of fallen fruit, nectar, and carrion. Yellow-jackets, a common type of wasp, may scavenge for dead insects to provide for their young. License to Kill pest control provides comprehensive residential pest control protection plans. 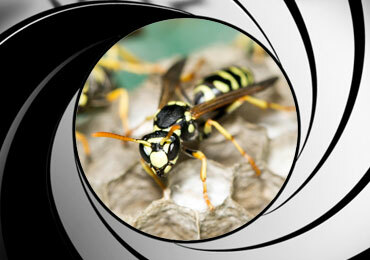 We specialize in wasp pest control. We have extensive experience eliminating wasps in historical structures, apartment complexes and commercial properties. At License-To-Kill, we understand pesticide sensitivity. If you’re allergic to pesticides, concerned about your pregnancy pets or children, we care and are prepared to work with you. Please call us today for your pest control needs. I saw a few wasps moving in and out from behind my outdoor mini fridge. Eesh! I called these guys and they came out, same day, and removed three (I had three?!) wasp nests for the price they quoted on the phone. They also warned me that while they can remove the nests, they can't prevent wasps from reassembling where they want. So far, though, I haven't seen them return. Same day service at a fair price works for me! Get Rid Of Your Wasps Today!